Over the weekend, I happened upon a stack of gift cards in my desk drawer. After diligently checking the balance on each and every one, I discovered that most had remaining balances that were less than $20. Rather than become frustrated by the lack of funds on the gifts cards, I was inspired to find items that were cute but inexpensive and could be purchased with the leftover gift cards. Just when you think you can't find anything functional or adorable under $20, think again! It's beach season (finally!! ), and it doesn't have to cost a fortune to look stylish on the sand. Start with a cute nautical themed beach towel such as this lobster one and a beach hat. The beach is no place for boring flip flops. These color block flip flops are fun and only $6! Don't forget the sunnies and a case to keep them in after the sun goes down. 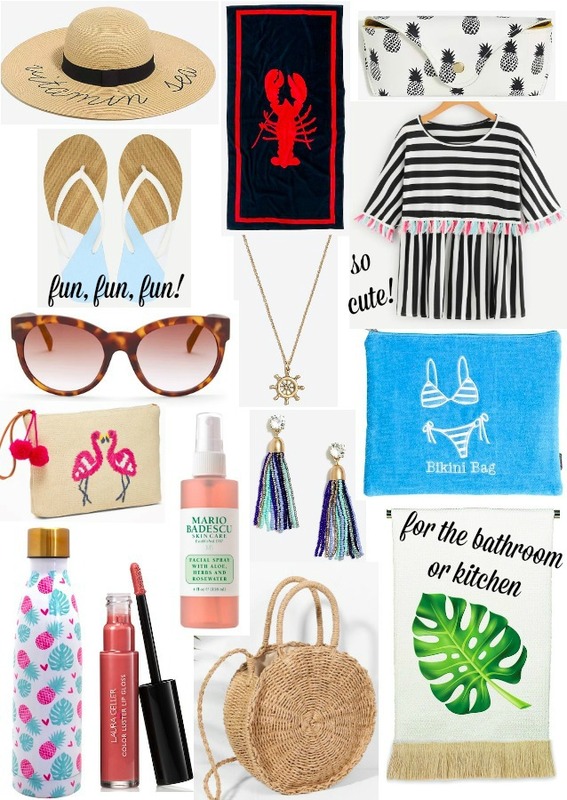 This bikini bag is perfect for storing a wet bathing suit, and this super cute pom pom clutch can store all your essentials when hitting the beach bar for aprés sun cocktails. And don't forget a quick swipe of lip gloss and a colorful pair of earrings to dress up your beach cover up when moving from beach to boardwalk. For quick daily errands, I love this straw circle bag. And don't forget to bring a bottle of water to stay hydrated during the dog days of summer.